I had the chance to wear the Nomos Zurich Weltzeit for a few weeks and I have to say that it was a pretty interesting experience. The Nomos Zürich Weltzeit was released in 2014 and comes in two different color versions. One with a white silver-plated dial and the second with a midnight blue dial. The hands are faceted and rhodium-plated. The name of the watch is a tribute to the city where the designer of the watch Hannes Wettstein was living and working. At first glance I thought that it would be way too big for me but once I got in on my wrist, I quite liked the oversized look! The first noticeable thing while looking at this watch is obviously the different cities that lay on the dial which makes you instantly travel in less than one second. A button enables you to travel the different time zones very quickly just by pushing it. I have to admit that it provides a very satisfying feeling and makes the watch very playful. In terms of caliber, The NOMOS Zürich Weltzeit has the brand’s most complicated movement. This automatic caliber is equipped with a world time and 24-hour display. As well as a proprietary escapement, the NOMOS swing system. We can read the time both at home and in 23 other time zones (but not at the same time!). Indeed, the Zürich Weltzeit is not a true worldtimer because it can display only two different time zones at the same time. To have an idea of what is a real World Time watch, have a look at the Patek Philippe 5230G World time. Next to the « home symbol » you can set your home time thanks to the disc next to it, while the hands can be set to your current time zone or any time zone you want to check. The Zürich Weltzeit’s case is very elaborate and add sophistication to the watch. No less than 10 separate pieces composed the case, Nomos even compares this case as a set diamond. A very welcome and important detail that distinguishes the Weltzeit to the others Nomos models that can be sometimes a bit stead for some people. What do I think about his watch? Two important things have to be said about this watch. Its lug-to-lug distance is around 48mm, which makes it honestly difficult for a small lady’s wrist to wear it if you are not crazy about oversized watches. Another thing is that the home time displayed on the disc is very small and can be hard to read. 50+, get your glasses on. But overall, The Zürich Weltzeit is a true good-looking watch. It gives you a travel style without any pretention. Thanks to its versatile design, it’s very easy to wear it with casual clothes as well as an elegant suit. 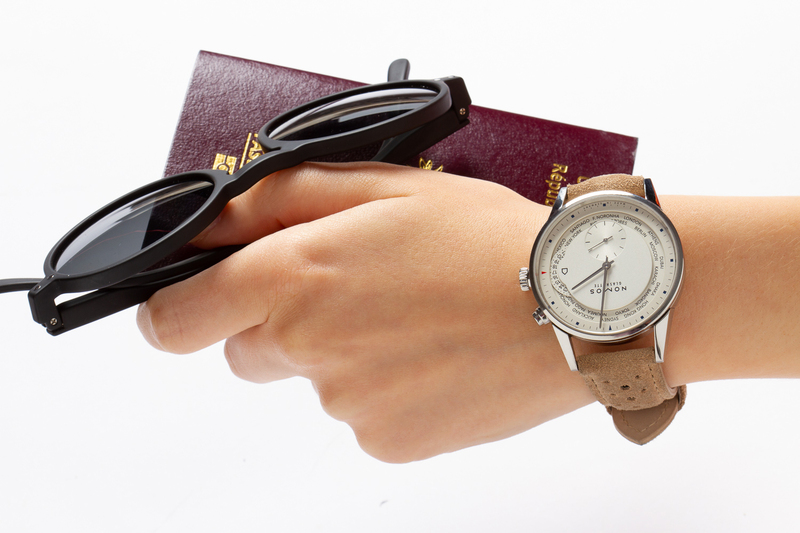 Of course the watch is really handy if you often travel the world or need to have the time of a specific time zone. In Nomos’ collection, the Zürich Weltzeit is truly the watch of the world.